The paper core machinesproducespaper cylilindic-shaped tubeto anydesired length, thicknessand diameter. 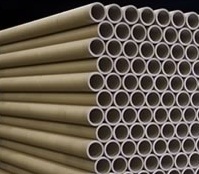 Paper cores are made by coating several thin papers over a metal pipe.With the continuous rotation of the papers on the metal pipe, a uniform papercylinder is developed. Then we have to cut the desired length. That process never stops.The technique used is called “flying saw” and paper cylinder cut is done while is in motion. When the length of paper cylinder we want to cut is reached, the saw starts running in straight and parallel movement, with speed equal to the speed of paper cylinder (synchronization).Throughout this movement, the saw cuts the paper cylinder in the desired length. When finished cutting, the saw returns to its original position and waits until the next desired length paper cylinder is reached. The cutting process is repeated until the desired number of completed paper cylinder. The servo system installed on the saw make substantial improvements to the machine. The movement of the saw is very smooth avoiding mechanical stresses. The speed of paper cylinder and the saw is equal to each other (synchronization), so maximum precision is possible. Increased production is achieved due to the cutting of the product while moving. Increase the quality of the finished product.